Corporation elects not to use a corporate seal pursuant to Minn. Stat. 317A.163. 1. Registered Office. The registered office of Corporation is the place designated in the Articles of Incorporation as the registered office. Corporation may change its registered office in accordance with Minnesota laws. The corporate records will be stored at Corporation’s registered office at the address on file with the Minnesota Secretary of State’s Office or by electronic file storage system maintained by the Corporation. 2. Other Offices. Corporation may maintain offices or places of business other than the registered office and mailing address on file with the Minnesota Secretary of State. Including those within or outside the State of Minnesota, as the Board may from time to time designate or the business of the Corporation may require. This Corporation is not organized for profit. Corporation is organized and shall be operated primarily to better the conditions of those engaged in agriculture or horticulture, to develop more efficiency in agriculture or horticulture, or to improve agricultural or horticultural products in accordance with Section 501(c)(5) of the Internal Revenue Code, or the corresponding section of a future federal tax code. To encourage the development of heritage breeds and to better conditions for those engaged in raising the American Guinea Hog. This includes but is not limited to: 1) Guarding the purity of the American Guinea Hog breed; 2) Registering and retaining pedigree records of all animals that qualify as American Guinea Hogs under the Association’s set of guidelines; 3) Providing technical support and opportunity for collaboration to American Guinea Hog growers and breeders to further the breed’s purity, conservation, and attract new breeders; and 4) Exhibiting livestock and educating the public in order to promote interest in the American Guinea Hog. 1. Types of Membership. The Board will have the authority to establish and define multiple categories of membership, if desired. 2. Eligibility for Membership. Application for membership will be open to anyone with an interest in the American Guinea Hog, who supports the mission and purpose of the organization, meets certain eligibility criteria and pays the annual dues/fees/assessments as set by the Board of Directors (unless special arrangements are made with the Board). a. Voting Members: Each Voting Member who wishes to be involved with Corporation, meets the eligibility requirements and pays the annual dues of membership will be considered a member in “good standing” who enjoys all benefits of membership, is allowed 1 vote, and is eligible to hold office in Corporation. i. Active Member. 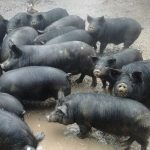 Any individual who is 18 years of age or old or older, family, household or corporation located in North America who owns and breeds American Guinea Hogs is eligible to become an Active Member. iii. Farm Manager Member. 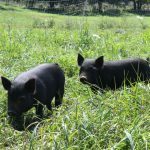 Any individual who is 18 years of age or older, family household or corporation located in North America who manages and breeds American Guinea Hogs is eligible to become a Farm Manager Member. 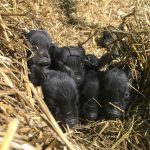 Farm Manager Members do not own the hogs being managed, yet make all management decisions regarding the herd as a whole as well as the individual hogs. Farm Manager Members must live in the vicinity of the herd being managed, must visit the herd at least twice a week, must be responsible for all decisions made regarding breeding and herd management, and must be responsible for all registrations and herd data submitted to Corporation as in these Bylaws. b. Non Voting Members. Non-voting Members who wish to be involved with Corporation meet the eligibility requirements and pay the annual dues of membership will be considered a member in “good standing” who enjoys the benefits of membership. Non-voting members are welcome to attend Corporation meetings but will have no voting rights and are not eligible to hold office. ii. Junior Member. 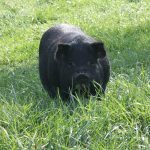 Any individual under the age of 18 years old and located in North America who owns and breeds American Guinea Hogs is eligible to become a Junior Member. Junior Members in good standing may register American Guinea hogs with AGHA. The fee for the Junior Member is one half the costs for Active Membership until the Junior Member reaches 18 years of age. Junior Members may not receive a lifetime membership. Junior Members must have their own herd prefix if they are a member of an existing Active Member family. 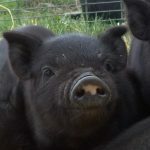 Junior Members must enforce all registry and herd management practices on their hogs as a separate and distinct herd from the Active Member family’s herd. 4. Annual Dues/Fees/Assessments. The Board of Directors will determine the annual dues and all other fees and/or assessments owed by members, and these dues/fees/assessments may be changed from time to time. The Board of Directors will publish the costs of the dues/fees/assessments on an annual basis to all members and prospective members. “Good standing” and continued voting membership is contingent upon being current on payment of dues/fees/assessments. Failure to pay dues/fees/assessments will subject members to removal after 30 days unless special arrangements are made with the Board. 5. American Guinea Hog Breeder Code of Ethics. Members in “good standing” will pledge to uphold the AGHA Breeder Code of Ethics developed by Corporation as part of their membership. Members will sign the Breeder Code of Ethics at the time of Membership/Renewal and a record will be kept by the Secretary. Members found to be in violation may be subject to sanctions, expulsions, etc as provided herein. e. Other such benefits as the Board of Directors may determine from time to time. 7. No Financial Obligation. No member will be responsible for any financial obligation of the Corporation. 9. Non-transferable. Membership in Corporation will not be assigned nor transferred in any manner. b. A majority vote of the voting membership. 2. “Good cause” may include acts detrimental to the Corporation and its mission-related work. This could include violation of Corporation’s Articles, Bylaws, Code of Conduct, Code of Ethics, Policies & Procedures, other rules, state/federal laws, misappropriation of Corporation assets, or actions/omissions in contravention to the mission and values of Corporation. 3. Pursuant to Minn. Stat. § 317A.411, any member being expelled or suspended will be given reasonable advance notice and the opportunity to be heard either orally or in writing at least five days before the termination, if the opportunity is requested by the member in writing. 4. The expulsion, suspension, or termination of a member does not relieve the member from obligations the member may have to Corporation for dues/fees/assessments, or for charges for goods or services. 5. Reinstatement of Membership. Former members of Corporation whose termination occurred, and who, during such absence, have maintained positive and active support of Corporation’s purposes, will be permitted to seek reinstated membership. The terminated member must submit an application to the Board of Directors. Corporation may reinstate the terminated membership by approval of a majority of the Board of Directors. 1. The record date for tabulating who are the voting members at the time of a voting members meeting will be 15 calendar days before the meeting. All members in good standing as of this date will be members entitled to notice of the meeting and entitled to vote at the meeting. The Board will maintain an alphabetical list of member names with addresses who are entitled to receive a notice and vote. This list will be approved and adopted by the Board of Directors as the official membership roster for providing notices for that particular meeting. The same list will be available at the meeting and used for voting member verification. 2. Notice to Members. Written notice, including the date, time, and place of the meeting, will be provided to each member listed on the official membership roll, at least 5 calendar days in advance of a member meeting. Notice will not be provided more than 60 calendar days in advance of a member meeting. This notice will be given personally, by mail, e-mail, telephone, facsimile or other reasonable method. a. Electronic Notice Consent. Corporation will solicit consent from members to receive notices and ballots by electronic communication. Corporation will use the contact information provided by the member when delivering notices or ballots. 4. Special Member Meetings. Special meetings of the members may be called by the President of the Board, a simple majority of the Board of Directors, or a petition signed by 50 individuals or 10% of the of the members entitled to vote, whichever is less. Business transacted at a special meeting is limited to the purposes specifically stated within the written meeting notice. No other business may beconducted. iii. If otherwise entitled, vote on matters submitted to the members. 6. Member Quorum. A quorum of the members is 10% of the members entitled to vote at that meeting. If a quorum is not present, the meeting may be adjourned and recalled with 5 days’ written notice provided prior to the new date. b. Ratification/rejection of amendments to the Articles of Incorporation and Bylaws. 9. Member Meeting Decorum. Corporation will follow best and lawful practices for conducting business at member meetings. The Board of Directors will exemplify, communicate, and enforce the expectation that meetings be conducted in an orderly and respectful manner. The Board of Directors reserves the right to excuse any Director, Officer, member, guest, member of the media, or audience participant exhibiting conduct that is disrespectful or disruptive to meeting proceedings. Per Robert’s Rules of Order Newly Revised, the President has the sole responsibility to require order in a meeting. To that end, the President has the authority to call a Director, Officer, or member to order, and exclude non-members. If necessary to maintain an orderly meeting, the President has the authority to remove a participant from the meeting. 10. Unanimous Action Without a Meeting. Pursuant toMinn. Stat. 317A.445, any action required or permitted to be taken at a member meeting may be taken without a meeting but by written action signed, or consented to by authenticated electronic communication (i.e. votes by e-mail, online, fax, etc. ), by all of the members entitled to vote on that action. The written action is effective when it has been signed or consented to by all of those members unless a different effective time is provided in the written action. 11. Action by Ballot. Any action that may be taken at a regular or special meeting of the members may be taken without a meeting, if the Corporation delivers a ballot to every member entitled to vote on the matter. Ballots must comply withMinn. Stat. §317A.447. a. Performance of any and all duties imposed upon them collectively or individually by law, by the Articles of Incorporation, these Bylaws, or other written policies and procedures of the Coporation. b. Appointment and removal of Directors and set their compensation (if any) subject to the limitations of these Bylaws. c. Employ and discharge , fix compensation for and prescribe duties and powers for all Officers, agents, employees, independent contractors, of Corporation. d. Manage and oversee the affairs and activities of Corporation, and setting policies and procedures. e. Enter into contracts, leases, or other agreements which are, in the judgment of the Board, necessary or desirable to obtaining the purposes of promoting the interests of Corporation. f. Acquire, manage, improve, encumber, leverage or dispose of real or personal property, through any lawfulmethod. g. Oversee the participation in financial transactions such as loans, debt obligations, investments, promissory notes, bonds, deeds of trust,mortgages, pledges, etc. h. Indemnify the Directors, Officers, agents, employees, or independent contractors for liability alleged against or incurred by persons in this capacity or arising out of the person’s status, or obtain insurance for these purposes. i. Uphold the Bylaws, Policies and Procedures of the Corporation. j. Report and update each individual’s mailing addresses with the Secretary of the Corporation, and receive Corporate notices at that address. The Board of Directors may engage in acts that are in the best interests of Corporation and that are not in violation ofMinnesota Statutes, specifically, Chapters 309, 317A, 501B, and Federal laws. No Director will have any right, title, or interest in or to any property of Corporation. There will be no cumulative voting among Directors. 3. Board Terms. All Directors will serve a 3-year term. There will be staggered terms of office, and there will be no limitation on the number of terms a Director may serve, except that no Director may serve more than 3 terms in a row. b. Election. An election will be held at the annual meeting. Outgoing Directors will hold office until their successors have been elected and qualified. c. Ballot. The election will be conducted by written ballot by those present and qualified to vote. In the event the annual meeting is conducted through remote communication, the election will be conducted by electronic written ballot in the form required byMinn. Stat. §317A.447. d. Votes Required. Each candidate must secure the highest number of votes cast in order to be considered elected (a plurality is required; a majority is not). e. Recount. At the annual meeting, any candidate may call for an immediate recount after the reading of the results. The results after the recount are final. 5. Resignation. A Director may resign or request a leave of absence at any time by giving written notice to the Secretary of Corporation. Notice may be electronic. The resignation or request for leave of absence may be deemed effective immediately without formal acceptance. If a resignation is effective at a later date, the Board may fill the pending vacancy with an interim Director before the effective date and the new Director will be seated on the effective date. If less than 3 Directors will remain after the resignation or leave of absence, the Director may not leave their position until a successor is elected to maintain the legal minimum number of Directors. 6. Leaves and Absences. A Director on leave will be considered an inactive member of the Board of Directors and will not have a vote. 7. Termination or Removal. Any Director may be removed for just cause, including excess unexcused absences, by an affirmative vote of at least 51% of the remaining Directors. The matter of removal may be acted upon at any meeting of the Board of Directors. A successive interim Director may then be elected to fill the vacancy created until the next annual election. 9. Compensation. No compensation will be paid to Directors of Corporation for their services, time, and efforts as Directors. Directors, however, may be reimbursed for necessary and reasonable actual (documented) expenses incurred in the performance of their duties. 10. Regular Board Meetings. The board will meet at least quarterly, at an agreed upon time and place. An official board meeting requires that each board member have written notice at least two weeks in advance. Regular meetings may occur through remote communication pursuant to Section 317A.231 of the Minnesota Statutes, if desired. Board members may appear by phone, virtually, or inperson. 11. Special or Emergency Board Meetings. Special meetings of the board may be called upon the request of the President, or by one-third of the board. Notices of special meetings will be sent out by the Secretary to each board member at least 2 weeks in advance. 12. BoardMeeting Notices. Written notices, including the date, time, and place of the meeting, will be provided to each Director at least 5 calendar days in advance of a meeting. Notice will not be provided more than 60 calendar days in advance of a meeting. This notice may be given personally, bymail, e-mail, telephone, or facsimile. 13. Board Meeting Quorum. At all meetings of the Board of Directors, a simple majority of 51% or greater of active Directors will constitute a quorum for the transaction of all authorized business. If 51% or greater of active Directors are not present, no voting may occur. The acts of the majority of the Directors present at a meeting with a quorum will be the acts of the Board of Directors ofCorporation. 14. Board Voting. During Board meetings, all matters will be decided by a simple majority vote of theDirectors. 15. Proxies. Voting by proxy will NOT be permitted in meetings of Corporation’s Board of Directors. 16. Private Entity – Open Meetings Not Required. Corporation is a private entity not subject to open meetings law and government data practices. The Corporation may hold its meetings open to the public from time to time, if desired. 17. BoardMeeting Procedures. All questions of order with respect to any member meeting will be resolved in accordance with Robert’s Rules of Order Newly Revised, as modified from time to time, or in such another orderly manner that is deemed appropriate by the President. 18. Board Meeting Decorum. Corporation will follow best and lawful practices for conducting business at member meetings. The Board of Directors will exemplify, communicate, and enforce the expectation that meetings be conducted in an orderly and respectful manner. The Board of Directors reserves the right to excuse any Director, Officer, member, guest, member of the media, or audience participant exhibiting conduct that is disrespectful or disruptive to meeting proceedings. Per Robert’s Rules of Order Newly Revised, the President has the sole responsibility to require order in a meeting. To that end, the President has the authority to call a Director, Officer, or member to order, and exclude non-members. If necessary to maintain an orderly meeting, the President has the authority to remove a participant from the meeting. 19. Board Written Action Without a Meeting. Pursuant toMinn. Stat. 317A, any action required or permitted to be taken at a Board of Director’s meeting may be taken by written action signed, or consented to by authenticated electronic communication (i.e. votes by e-mail, online, fax, etc. ), by the number of directors that would be required to take the same action at a meeting of the board at which all directors were present. 1. Principal Officers. Principal Officers of Corporation will be: President, Vice President, Treasurer, and Secretary. At the discretion of the Board of Directors, other Officers may be elected with duties that the Board will prescribe. 2. Election of Officers. Officers must also be Directors of Corporation. Officers will be elected annually at the first Board meeting following the election of Directors. A vacancy in any office may be filled by a majority vote of the Board of Directors for the unexpired portion of the term. The Board of Directors will also have the authority to appoint temporary acting Officers as may be necessary during the temporary absence or disability of regular Officers. 3. Officer Terms. All Officers will serve 2 year terms. There will be no limit to the number of terms an Officer may serve; however, in the case of the Treasurer, the Treasurer may serve only up to 2 consecutive terms. After serving 2 consecutive years, the Treasurer must take at least 2 years off from the Treasurer position before being considered for another term as Treasurer. 4. Officer Resignation. An Officer may resign by giving written notice to Corporation. The resignation is effective without formal acceptance when the notice is given to the Board, unless a later effective date is named in the notice. 5. Officer Removal. Any Officer may be removed from his/her position for just cause by a majority vote of the remaining Directors. The matter of removal may be acted upon at any meeting of the Board ofDirectors. 6. Officer Compensation. Officers may be reimbursed for necessary and reasonable actual (documented) expenses incurred in the performance of their duties. a. President. The President will convene regularly scheduled board meetings, will preside or arrange for other members of the Executive Committee to preside at each meeting in the following order: Vice-President, Secretary, Treasurer. c. Secretary. The Secretary will be responsible for keeping records of board actions, including overseeing the taking ofminutes at all board meetings, sending out meeting announcements, distributing copies of minutes and the agenda to each board member, and assuring that corporate records are maintained. Any Officer of Corporation, including those not named here, in addition to the duties and powers conferred upon him or her by these Bylaws, will have additional duties and powers as may be prescribed from time to time by the Board of Directors. 2. Executive Committee. The Board of Directors, by resolution adopted by a majority of the Board, may establish an Executive Committee to consist of the President, Vice President, Treasurer, and Secretary. The President will be the Chair of the Executive Committee. The designation of the Executive Committee and the delegation of authority granted to it will not operate to relieve the Board of Directors of any responsibility imposed upon it, as it is subject to the direction and control of the full Board. However, the Executive Committee will have all the powers and authority of the Board of Directors in the intervals between meetings of the Board of Directors, except for the power to amend the Articles of Incorporation and Bylaws. No individual will continue to be a member of the Executive Committee after he or she ceases to be a Director of Corporation. 3. Finance Committee. The Board of Directors, by resolution adopted by a majority of the Board, may establish a Finance Committee. The Treasurer is the Chair of the Finance Committee, which includes three other Active Members . The Finance Committee is responsible for developing and reviewing the fiscal procedures, fundraising plans, and the annual budget with staff and / or other Board Members. The Board must approve the budget and all expenditures must be within budget, unless the budget is revised. Any major change in the budget must be approved by the Board or the Executive Committee. Annual reports are required to be submitted to the Board and reviewed annually. Annual reports must show income, expenditures and projected income. The financial records of the organization will be made available to the Directors, Officers, members, and all other persons in any way affiliated with Corporation. 4. Committee Meetings. Meetings of the individual committees may be held at a time and place as may be determined by a majority of the committee, by the Board President, or by the Board of Directors. Notice of meetings will be given to the committee’s members at least 5 business days in advance unless all members agree to a shorter notification. A majority of the committee’s membership will constitute a quorum. 1. Designation. The Board of Directors may select and employ an Executive Director. The Executive Director will be engaged by and act as the administrative agent of the Board of Directors to administer the affairs of Corporation and implement the policies and decisions of the Board of Directors. The Executive Director has no power or authority apart from that which is delegated to them by the Board of Directors, and the Board has the duty and responsibility to adequately monitor the actions of the Executive Director. The Executive Director will be a non- voting ex officio member of all standing committees and will attend and may participate in all meetings of the Board of Directors except when matters regarding their employment and compensation are under consideration. The Executive Director may also serve as a Director and / or Officer if permitted by the Board of Directors; however, strict adherence to the Conflicts of Interest policy will be necessary. The Executive Director will only be compensated in his or her capacity as an employee. The Executive Director is not permitted to serve as Treasurer. 2. Compensation. Corporation may pay compensation to the Executive Director, employees, and other independent contractors for services rendered. The amount and frequency of payments will be reasonable, determined from time to time by the Board, and be legally compliant with all state and federal employment, nonprofit, and other applicable laws. 3. Checks, Drafts, Petty Cash Fund. The Executive Director may be authorized to provide one of the signatures on checks, drafts, or other orders of payment for Corporation. He or she may also be authorized to administer a Petty Cash Fund, the size of which will be designated by the Board ofDirectors. The Board of Directors may establish policies and procedures to recruit, train, and utilize volunteers in the operation of its activities and fulfillment of its purpose and mission. Corporation may maintain a special accident policy to cover those individuals serving the organization in a volunteer capacity. 1. Financial Year. The accounting year of Corporation will begin on January 1 and end on December 31.
a. Corporation will maintain appropriate checking, savings, and other accounts at a reputable bank or financial institution under the name of Corporation. b. The President and Treasurer are authorized to act as signatories on all Corporation financial accounts. In the event the Presidency is temporarily vacant or the President is removed or incapacitated in some manner, the Vice President is authorized to temporarily act as a signatory in the President’s place. In the event the Treasurer’s position is temporarily vacant or the Treasurer is removed or incapacitated in some manner, the Secretary is authorized to temporarily act as a signatory in the Treasurer’s place. c. Corporation’s books and accounts (or an exact copy thereof) will be kept at the registered office and / or in a cloud account which provides access to all Directors. d. All money raised in Corporation’s name will be deposited in Corporation’s account as charitable assets and used for Corporation’s charitable purposes according toMinnesota and Federal fundraising laws and rules. 3. Examination by Directors andMembers. EveryDirector, Officer, and member of Corporation will have a right to examine, in person or by agent or attorney, at any reasonable time, and at the registered office or via the cloud account, all books and records of Corporation and make extracts, reports orcopies. 4. Ownership of Intangible Assets. Directors and Officers may from time to time establish accounts on behalf of the Corporation for third party services such as web domains, web services, software services, donor or member lists, etc. All accounts of this nature are assets of the Corporation and should be opened in the name of the Corporation whenever possible. If ownership cannot be established in the name of the Corporation, the individual Director or Officer must grant secondary authority whenever possible, or share account information and log in credentials to another Director or Officer to preserve right of access to these assets and accounts. 5. Legal Instruments. All contracts, agreements, and other legal instruments executed by Corporation will be issued in the name of Corporation, not the individual name of a Director or Officer. The Board may establish internal controls or policies which control the number of officers required to sign legal instruments. While Directors and Officers may have authority to sign official documents on behalf of Corporation, they may do so only after proper consideration and approval by the Board of Directors. In the absence of documented approval by the Board of Directors, the individual Director or Officer is personally liable on the legal instrument. 6. Loans. No loans will be contracted on behalf of Corporation nor will evidences of indebtedness be issued in its name unless in conformance with Section 317A.501 of the Minnesota Statutes and specifically authorized by resolution of the Board of Directors. This authority will be confined to specific instances. c. Whether Corporation is properly filing annual paperwork with the Minnesota Attorney General’s Office, Minnesota Secretary of State, Internal Revenue Service, and other government entities. Corporation will file the Form 990 with the IRS annually. In addition, Corporation will file all required employer reports to agencies such as the Minnesota Unemployment Insurance Fund, the Minnesota Dept. of Revenue, the Minnesota Attorney General’s Office, the Minnesota Secretary of State, the Social Security Administration, and provide employee tax documents by the required deadlines. d. Whether Corporation is properly engaging inMinnesota and Federal fundraising laws and rules. 8. Affiliations. Corporation maymaintain professional affiliations that benefit and strengthen the organization in its capacity to fulfill its mission. 10. Amending the Articles of Incorporation and Bylaws. Corporation has the power to amend the Articles of Incorporation and any Bylaws. A majority of the Board of Directors must approve amendments to the Articles or Bylaws. In addition, the voting members will approve amendments to the Bylaws at a member meeting. Pursuant to Minn. Stat. §317A.133 the voting members may authorize the Board of Directors to amend the articles without approval of the members.